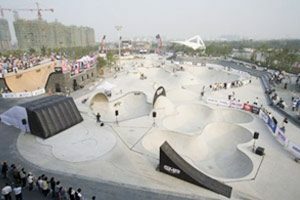 SMP Skate Park is an enormous outdoor park that spans 44,936 square feet and is the largest skate park in the world in New Jiangwan City, Shanghai, China. 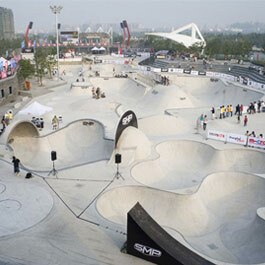 Each year SMP holds an international skate competition known as “The Showdown.” If you’re a skater, it’s hard to think of a more fitting place to compete. Not a skater, not a problem! Enjoy the activities from a 12,300 square foot viewing deck and plaza! 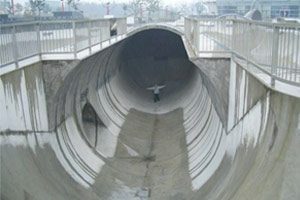 Riders will find an exceptionally long vert ramp with two extended roll ins, bowls that spine into other bowls, a massive full pipe, pipes that lead from one section of the park to another, flat banks, quarter pipes of all sizes, a mini ramp, fun boxes, hips, grind poles, hand rails, wall rides and more. Whether you are an amateur or highly experienced, SMP has something to offer for everyone!